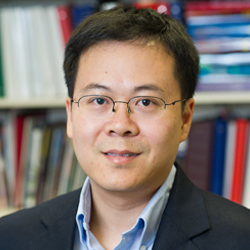 Jiaxing Huang is a Professor of Materials Science and Engineering at Northwestern University. He received his B.S. degree in Chemical Physics from USTC, Ph.D. in Chemistry from UCLA, and became a Miller Fellow at UC Berkeley before joining Northwestern in 2007. In research, his group aims to create new knowledge, materials and techniques that are potentially useful. Through teaching, they aim to develop intuition, inspire creativity and bring the best out of students and themselves. His work has been recognized by awards from the National Science Foundation, the Sloan Foundation, the Society of Manufacturing Engineers, the American Vacuum Society, and the International Aerosol Research Assembly. He is included in the lists of Highly Cited Researchers (Thompson Reuters/Clarivate Analytics) and Most Cited Researchers in Materials Science and Engineering (Elsevier). He is also a recipient of the Guggenheim Fellowship, the JSPS Fellowship from Japan and the Humboldt Research Award from Germany.